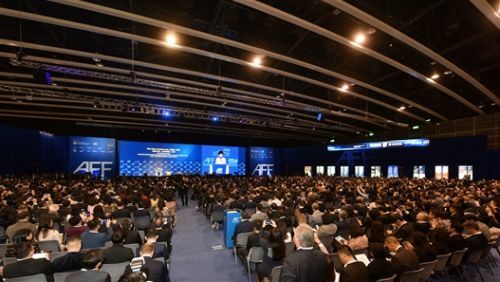 HONG KONG, Jan 14, 2019 - (ACN Newswire) - Organised by the Hong Kong Special Administrative Region (HKSAR) Government and the Hong Kong Trade Development Council (HKTDC), the 12th Asian Financial Forum (AFF) opened this morning and runs for two days (14-15 Jan) at the Hong Kong Convention and Exhibition Centre (HKCEC). Under the theme "Creating a Sustainable and Inclusive Future," this year's AFF brings together more than 130 policymakers, financial and business leaders and heavyweight investors to survey the current global economic environment and offer insights on the opportunities and challenges that businesses will face in the coming year. A series of topical issues related to innovation and technology will also be examined to encourage the financial sector to leverage new technologies for facilitating sustainable and inclusive development. "The world therefore needs new ways to stimulate growth and development. To do so, we must work together with a shared vision," said Mr Lo. "One such vision can be found in the Belt and Road Initiative, which was introduced by China five years ago." He explained that the initiative, aimed to drive global development, can provide a framework to connect and create economic and social activities. 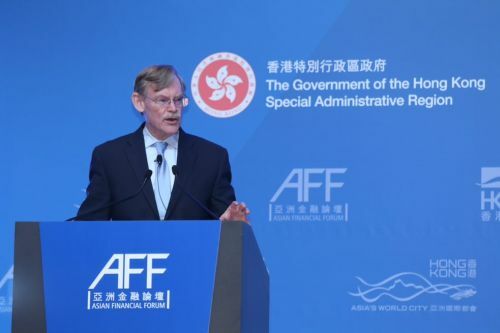 "Events such as the AFF are all the more important in times of global challenges because they give us the opportunity to share problems, discuss solutions and work together to find a clearer path ahead," Mr Lo added. The AFF opened with a plenary session titled "Creating a Sustainable and Inclusive Future: Opportunities and Challenges". Chaired by James Lau, Secretary for Financial Services and the Treasury of the HKSAR, the panel featured heavyweight international speakers including Michael D'Arcy, Minister of State at the Department of Finance with special responsibility for Financial Services and Insurance, Ireland; Pierre Gramegna, Minister of Finance, Luxembourg; Jin Liqun, President and Chairman, Asian Infrastructure Investment Bank; Lim Guan Eng, Minister of Finance of Malaysia; and Wang Zhaoxing, Vice President, China Banking and Insurance Regulatory Commission. Together they explored opportunities and challenges to driving growth and building a better future through sustainable and inclusive development. The panel discussion that followed, "Managing Global Financial Risks and Opportunities in 2019", saw financial experts sharing insights on hot-button issues for the global market and financial policymaking, including heightened market volatility, monetary policy normalisation, Brexit, fiscal discipline in the European Union, green finance and fintech. The panel was chaired by Eddie Yue, Deputy Chief Executive, Hong Kong Monetary Authority, with panellists including Burkhard Balz, Member of the Executive Board, Deutsche Bundesbank; Dennis Beau, First Deputy Governor of the Banque de France; Saeb Eigner, Chairman, Dubai Financial Services Authority; and Sergey Shvetsov, First Deputy Governor of the Bank of Russia. Four new panel discussions were held at the AFF this year. The panel discussion on "Global Investment in the New Economy" examined investment risks and opportunities amid an ever-changing global financial and economic landscape. Speakers included Raja Easa Al Gurg, Managing Director, Easa Saleh Al Gurg Group LLC and President, Dubai Business Women Council; Raymund Chao, Chairman, Asia Pacific and Greater China, PwC; Denis Duverne, Non-Executive Chairman of the Board of Directors, AXA Group; John Flint, Group Chief Executive, HSBC Holdings plc; Nobuyuki Hirano, President and Group CEO, Mitsubishi UFJ Financial Group, Inc; and Michel M Lies, Chairman of the Board of Directors, Zurich Insurance Group Ltd. The panel discussion on fintech trends and regulations featured Chris Church, Chief Business Development Officer, Digital Asset; Eddi Danusaputro, Chief Executive Officer, Mandiri Capital Indonesia; Soul Htite, Chairman and founder of Dianrong; Daisuke Iwase, Group Chief Digital Officer, AIA Group Limited; and Alex Kong, founder and Chairman, TNG FinTech Group. As the world's second-largest economy, China's financial and economic policies hold sway over the global economy. A Dialogue Session, chaired by Lawrence Lau, Ralph and Claire Landau Professor of Economics, The Chinese University of Hong Kong, examined the economic outlook and investment development in the mainland, featuring Tu Guangshao, Vice Chairman and President, China Investment Corporation, and Zhu Guangyao, former Finance Minister, People's Republic of China. The second day of the AFF tomorrow will feature more stimulating and thought-provoking sessions. The Breakfast Panel, sponsored by Hong Kong's Financial Services Development Council, will explore the city's role in the ever-changing international trade environment. Launched last year, the InnoTalks series returns with various workshops that will explore technological issues relevant to the financial sector, including regtech, insurtech, developments in the Guangdong-Hong Kong-Macao Greater Bay Area, cultural transformation, fostering SMEs through fintech, blockchain and cyber security, and the use of technology in asset management. The new FinTech Showcase, launched at this year's AFF, enables international financial institutions and technological enterprises to present their innovative applications and solutions to the industry. Exhibitors include AlphaPoint, HSBC, Mitsubishi UFJ Financial Group, NEC, Prime Trust, PwC, TNG FinTech Group, as well as 4 Paradigm, Beijing Kuangshi Technology, BBD, China Payment & Clearing Network and Yusys Technologies from the mainland, covering areas such as artificial intelligence (AI), blockchain, Internet security, big data, fintech and payment technologies. The showcase encourages the use of new technology in the industry to help it stay competitive and improve business efficiency. This year's forum once again features the AFF Deal Flow Matchmaking session, co-organised with the Hong Kong Venture Capital and Private Equity Association, to provide pre-arranged deal-sourcing and matchmaking meetings for project owners and investors. Involving more than 500 investment projects, it covers manufacturing and environment technology, digital technology, fintech, healthcare technology, infrastructure and real estate services, education, environment and energy, and agriculture. Some 700 one-on-one meetings are expected to be arranged. The InnoVenture Salon is back with expanded scale and enriched content, including the Startup Zone, Fireside Chat, Demo Hours, Startup Clinic as well as one-to-one meetings at Investor Alley to comprehensively support the development of start-ups. PwC returns as the AFF's Knowledge Partner for the fourth consecutive year, setting up the PwC Knowledge Cafe and a satellite booth with the theme of "Shaping the Digital Future". Eight technology offerings in the Cyber, FinTech and Transformation space will be showcased. Apart from the Greater Bay Area insights zone and a "Fuel your Knowledge" coffee bar, the booth will feature an interactive augmented reality (AR) city board game called "Knowledge Crush". This interactive game will include emerging technologies such as drones, robotics, AR and blockchain. The 12th edition of the Asian Financial Forum (AFF) opens at the Hong Kong Convention and Exhibition Centre today. Under the theme "Creating a Sustainable and Inclusive Future", AFF 2019 features more than 130 speakers from around the world who will examine the latest global economic environment, explore new opportunities, and discuss topics related to innovation and fintech.